Sickle cell disease (SCD) is the most prevalent hemoglobinopathy in the USA. 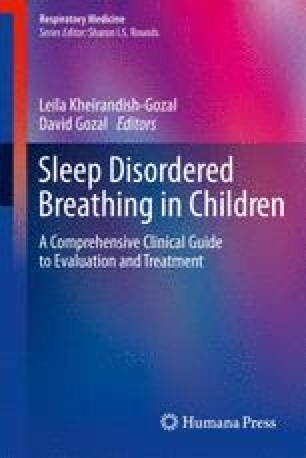 It has been reported that children with SCD have an increased risk for sleep problems including sleep-disordered breathing (SDB) compared to the general pediatric population. These children are also at an increased risk for adenotonsillar hypertrophy due to secondary hyperplasia of the lymphoid tissues following splenic infarction and extramedullary hematopoiesis. They are, therefore, more likely to develop upper airway obstruction. Both daytime and nocturnal hypoxemias are common in children with SCD; however, the accuracy of pulse oximetry in measuring oxyhemoglobin saturation has been questioned by several investigators. In this chapter, we attempt to review the prevalence of various sleep problems including SDB in children with SCD and discuss the link between SCD and hypoxemia, SDB, vaso-occlusive crises, stroke, and pulmonary hypertension. We review common sleep problems and their clinical presentation in children with SCD and outline their evaluation and treatment strategies.